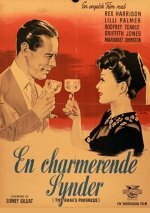 The first film produced by Frank Launder and Sidney Gilliat for their Individual Pictures company is a brisk comedy drama that, if not as elegant and sophisticated as it would have us believe, perfectly suits the debonair style of Rex Harrison. His exploits, first as a student at Oxford and then among the upper reaches of polite society, have a jaunty air and provide a nostalgic glimpse of Britain between the wars. Although some of its feel-good aura has diminished, the film still entertains over 50 years on.